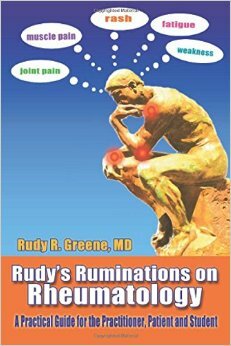 Rudy R. Greene, MD, FACR, is a board certified rheumatologist, who has been in practicing for nearly thirty years. He earned a BA in English literature and an MD from the University of Toronto. He went on to complete his internal medicine training at St. Mary’s Medical Center in Long Beach, California, and a rheumatology fellowship at the University of Southern California at Los Angeles. Dr. Greene served as associate professor of medicine at both USC and the Oregon Health Sciences University. EB: What motivated to write this book? RG: To make rheumatology and its practice understandable and accessible to everyone. Ultimately, I want to educate and leave a legacy. Finally, I want it to pay for my retirement. EB: How did you first get interested in medicine and rheumatology? RG: I was an aimless English major in college afraid that no one would buy my novels and decided I wanted an intellectually challenging profession in which I could help people, be a perpetual student and be financially secure. When I did my first rotation in rheumatology as an internal medicine resident it was love at first sight. It was the perfect fit–very social, intellectual and ever changing. Also, patients had chronic diseases and you followed them over years so they became family. EB: How has the field changed since you began practicing? RG:The practice has caught up to the science. We now have medications that actually put patients into remission and stop diseases cold! EB: Your book is for patients, practitioners, and students. Did you find it challenging to write for all three audiences at once? RG: It was a little difficult striking a balance between accessible and too complex. I always tried to put on paper words and terms that anyone could understand but never talk down to any of my audience. EB: You mention in the book that you sometimes prescribe yoga and Pilates to patients. What is the role of lifestyle in managing illness? RG: Healthy diet, exercise and psychological climate impact every disease and sometimes can fix mechanical problems such as a bad back or knee. They are usually complementary for systemic problems. EB: You are also a poet and fiction writer. Have you always enjoyed writing? RG: I wrote creative birthday cards at an early age and began writing poetry by age 14. EB: As a poet, what do you think is the role of the humanities—writing, literature, and philosophy– in medicine? RG: They are extremely important. Patients put their physical and psychological health in doctor’s hands. Doctors deal with mortality, ethical and moral issues daily. Any person who does not these issues seriously, does not like people or does not communicate well should not be a physician who deals with patients. EB: One of the things I appreciated about your book was that it addressed patients. We hear a lot about medical education for practitioners, but what should patients be learning about medicine in their general education? RG: There is science behind allopathic medicine that can be validated and duplicated. Good long term placebo controlled double blinded studies are important. Testimonials do not legitimize therapies. Learn about diseases from well accredited and respected sources such as the NIH, CDC, subspecialty colleges or major universities. Beware of outliers who claim that delegitimize the mainstream. Learn how to analyze studies and how to be a critical thinker. RG: Great questions. A pleasure!